Amidst all the extravagant gadgets CES 2019 is bombarding us with, there are actually some smartphones that are making a debut at the expo in Las Vegas. Granted, it’s unlikely that these will make you giddy with excitement, but still, let's check a couple of them out! Coming from TCL Communication are two Alcatel smartphones that cost less than most decent headphones (even combined). First up is the Alcatel 1X. Now, before you start judging its specs, which aren’t amazing, let us give you the price: $120. That’s about 10 times less than the price of a higher specced iPhone. Okay, back to the internals. The Alcatel 1X comes with a quad-core MediaTek system chip, 2GB of RAM and 16GB of storage. The display spans 5.5 inches, has a resolution of 720x1440 pixels and is surrounded on the top and bottom by relatively small bezels. The rear dual-camera combo is said to offer portrait mode, while the front one allows the phone to have a face unlock feature. But worry not, for improved security it also has a fingerprint sensor on the back (if you’re in one of the selected markets, that is). What’s left? Oh right, it has a 3000mAh battery, a headphone jack and Android 8.1. Let’s not forget though, $120. Perfect for introducing a kid or an elderly relative to the world of smartphones without worrying they might lose, break or otherwise mess up their device. 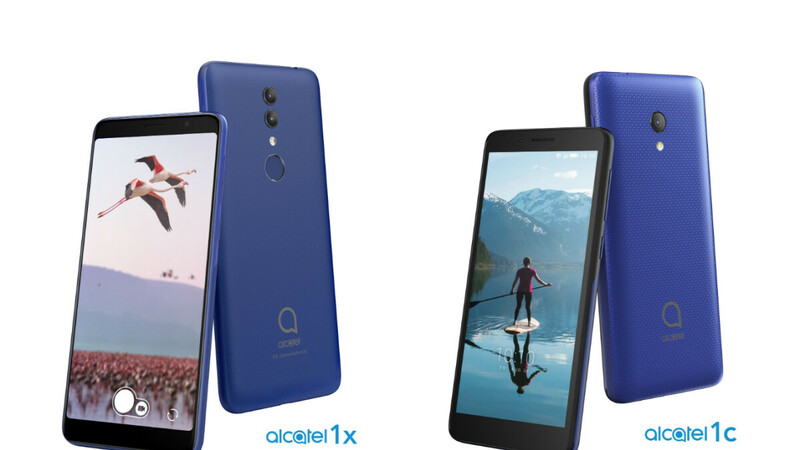 The Alcatel 1X’s even cheaper sibling, the Alcatel 1C, isn’t coming to the US market, but we can’t just ignore it, right? And yes, you read that right, the 1C is in fact much cheaper, as unbelievable as that sounds. Meant for emerging markets like South America, Asia and Africa, this Alcatel smartphone is going to cost the equivalent of $80. Obviously, for that price, you have to make even more compromises. We’re not even going to mention the system chip, because you haven’t heard of it anyway. The 1 GB of RAM should immediately notify you that we’re talking about a device that’s running the Go edition of Android Oreo, which includes light versions of Google’s apps specifically made for such ultra-budget smartphones. The screen has a humble 4.95-inch diagonal and 480x960 resolution. The main camera fits the rest of the specs with its whopping 5MP sensor, while the selfie one stops at 2MP. Hey, at least there is one! While those aren’t exactly 2019 specs, it’s all about the purpose this phone is going to serve. For some, this will not only be their first smartphone but likely their first mobile phone period. And, well, that is definitely a start.